Priyanka and Jimmy in honour of the Hindu festival celebrated Holi on Monday night on The Tonight Show. Last year Priyanka Chopra celebrated Holi with her Quantico co-stars. But, this year she chose The Tonight Show host Jimmy Fallon to bring the festival of colours on the talk show. 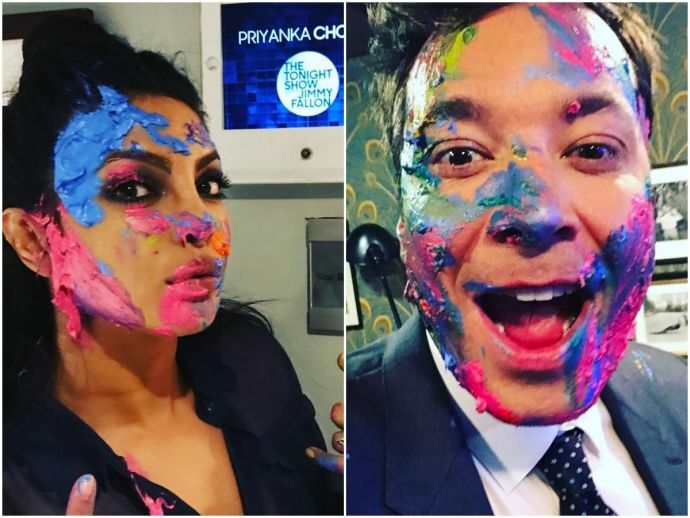 Priyanka along with Jimmy, in honour of the Hindu festival, had a messy Holi celebration on the Tonight Show which aired on Monday night (13th March). Celebrating my first #Holi ??? ?in NYC with @priyankachopra @danasupnick . Holi is a celebration In India known as a festival of colors . ??????????????? ?❤️ #HappyHoli to you #priyankachopra ??????????? ?